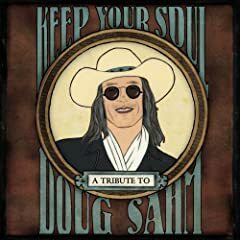 Keep Your Soul: A Tribute To Doug Sahm is available now. The album features Greg Dulli covering “You Was For Real” along with performances by Dave Alvin, Los Lobos and Alejandro Escovedo. Most of the artists on the CD — including Dave Alvin, Alejandro Escovedo, and Delbert McClinton, all of whom provide worthwhile interpretations — are no big surprise. But somehow I’ve never associated the music of Greg Dulli (The Afghan Whigs, The Twilight Singers) with the music of Doug Sahm. So Dulli’s contribution, “You Was for Real” is the big surprise of the album. Even though there’s steel guitar (Greg Leisz) and fiddle (Amy Farris), it’s unmistakably Dulli. He’s played with the melody of the song — originally a cry-in-your-beer honky-tonker — and turned it into a dark, minor-key slow-burner. You might call the sound “Twilight Tornado.” It’s truly one of the tribute’s highlights.